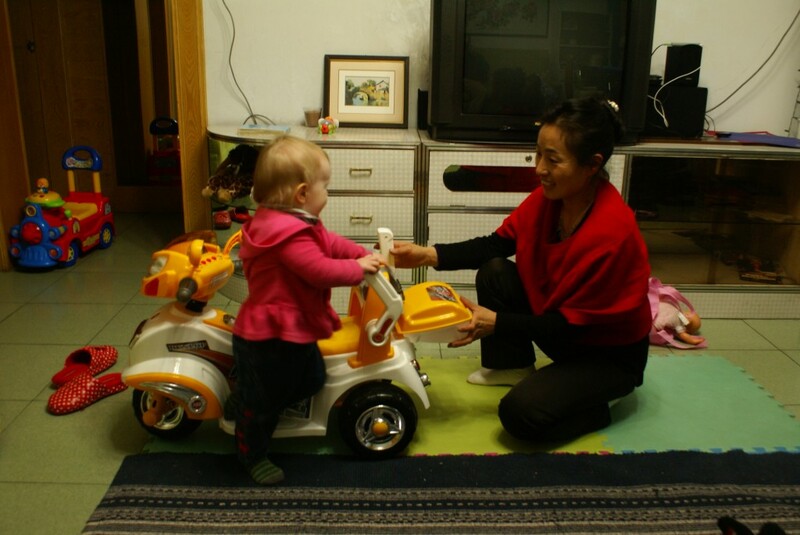 The afternoon we returned from Thailand our a-yi (babysitter) came by to see Juliana. Obviously she had missed Juliana during our three weeks away, and while Juliana didn't come running and squealing like usual, she was excited to see her a-yi as well. 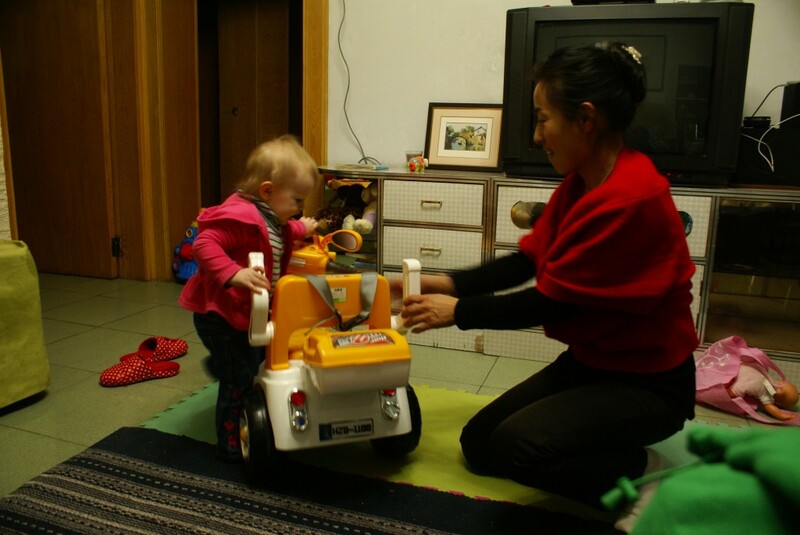 A-yi came in the door out of breath, not just from climbing to the sixth floor but from climbing to the sixth floor carrying a very large motorized riding car toy, her very large present for Juliana. Gift giving is definitely an important part of Chinese culture. You bring fruit or flowers when visiting someone's home. You bring back small trinkets or a local “specialty” from traveling (something we totally forgot about this year in Thailand). At Mid-Autumn Day, you exchange moon-cakes with practically everyone you know. As teachers, our school would always give us a Christmas/New Years gift, and our students would give us presents at the end of the year. Lots of gifting going on. But usually the gifts are pretty small, a couple of dollars worth of fruit, not a fancy toy that probably cost $50. So we felt a little awkward about this gift and wondered what was behind it. Juliana had no such hesitation. Who cares about the reason; she just got a giant new toy! 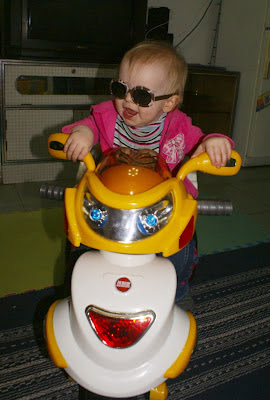 She climbed up on the seat (backwards), played with the moveable armrests, opened the storage box to examine the instruction packet and wall charger, fiddled with the handle bars (I guess it's actually a giant motorbike), and of course, pushed the buttons that made the very loud noises. One button made car noises, an endless grinding turn-over sound, like a car that may or may not start. A loud horn. And of course, a button that plays loud, barely identifiable children's songs. Juliana loves it. She was excited to hear the ABC song, probably her current favorite, right up with Old MacDonald. It wasn't until a few days later I realized that while the first part of the song is fine, once it gets to “O-L-N-O-M,” it's all downhill from there. The car also has a little foot petal to activate the motor and made a little jump forward whenever Juliana accidentally stepped on it. The car even has a little seatbelt! Amazing. But did I mention that it's very large? It's really an outside toy. And we live on the sixth floor. The thought of carrying Juliana and a very large toy car down and back up all those stairs didn't really make me happy. But she had the car, and I figured I'd better let her use it, so the next day I hauled it downstairs for her. I strapped her nicely in and showed her how to push the motor petal...and all she wanted to do was get out and run around. I thought, “I carried this all the way downstairs, darn it! Enough with your exercise – play with the toy! Play with the toy!” And then I let her run around because of course it was ridiculous. I called Kevin to come down and pick up the toy, and Juliana spent the next thirty minute happily wandering around on her own two feet. The car was moved out to the laundry porch for storage, our catch all for objects we don't really know what to do with, and there I discovered its good use: occupying Juliana while I hang up laundry. She plays with her toy instead of trying to eat lead paint chips and I get the laundry up; a win-win situation. A few days later we discovered the reason (or at least part of the reason) behind this over-the-top gift; a-yi and her husband started their own business, so she won't be able to watch Juliana anymore. In typical indirect fashion, she didn't mention anything about this when she was with us; it only came out through our teammate's prodding. So now we begin the semester a-yi-less. We are really sad to lose our old a-yi because she and Juliana loved each other. The first week Juliana cried when I left her; thereafter she cried when a-yi left. It's going to be hard to find someone else who connects so well with Juliana. But find someone we must, if we are going to be able to start meeting with tutors again, an intrigal part of our language learning. And that car is just not going to do a lot of babysitting for us. After a few bad experiences with poorly designed Chinese airports, last week we finally found something good about one of the worst. Flying through the Guangzhou airport -- where you often have to leave the secure area and run completely across the airport if connecting from a domestic to international flight -- we discovered the nursery. We arrived from Bankok with almost four hours to kill until our next flight (we had just missed the cutoff to use a special "layover lounge" offered for those with layovers of more than four hours). 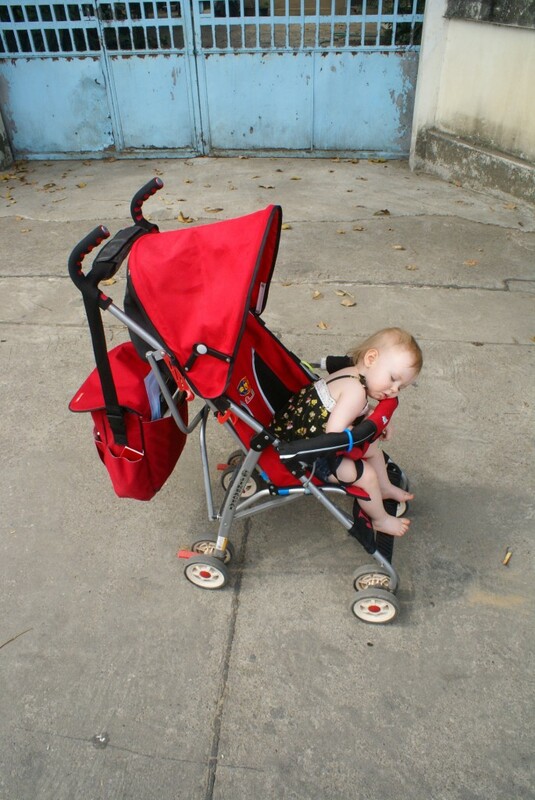 We weren't looking forward to the prospect of trying to entertain Juliana for that entire time. Just yesterday, Juliana kept an entire crowd of waiting passengers entertained as she threw her little ball across the floor and chased it, tossing out gleeful squeals of delight or "ut ohs" with every toss. Then I spent some time trying to divert her from the trash can and evoking pained screams when I blockaded her from following mommy into the dingy bathroom. By the time we got onto the plane, we were probably more tired than she was. So, at the Guangzhou airport, when I noted the nearly empty baby nursery, I figured it was worth a try. Ruth seemed apprenhesive: "do you think they would just let us hang out in there?" 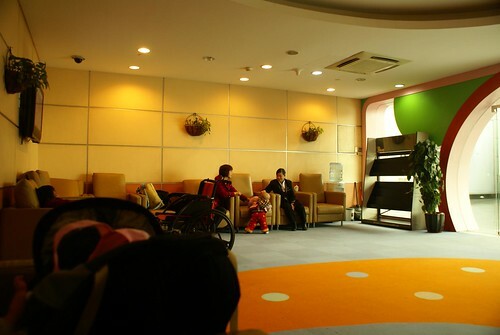 When we walked into the carpeted room, which is lined on three sides with 18 comfy plush chairs--the kind airports only supply in some posh first-class lounge--a pair of Chinese grandparents were changing their newborn granddaughter's diaper while her baby's parents quietly looked on. The restrooms were spotless -- better than anything I've ever seen in a public place in China. And in another corner of the room, an airport employee had pulled a chair cushion onto an armrest, propped up a newspaper, and settled in for at least an hourlong xiuxi in spite of the noisy squelches eminating from her walklie-talkie every few minutes. 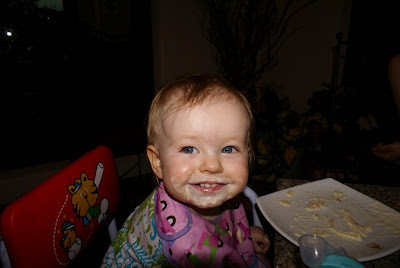 We fed Juliana some yogurt and she excitedly imitated the newborn's coos. 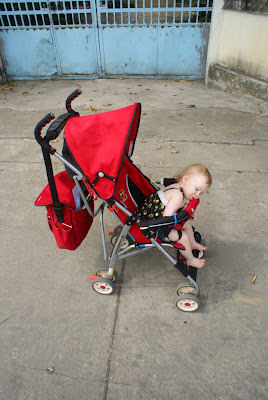 When the family and walkie-talkie toting napper left, we decided to close the doors and try giving Juliana a nap. It was like shoving cottin into our weary ears. Immediately, the hustle and bustle of the airport was muffled. Flight announcements disappeared, squeaking luggage wheels faded. We were left with near silence. Within a few minutes of rocking her in my arms, Juliana was asleep. And Ruth closed her eyes to rest. For a good 20 minutes, the silence remained. Until another airport worker arrived. Pushing a wheelchair-bound passenger, she thrust the doors wide. Airport noise rushed in like water from behind a dam. Seemilngly oblivious to the napping baby in my arms, she made no attempt to quiet her walkie-talkie, which blared incessantly while she smugly clanked tea cups and scrawled something into a log book. I scoweled at her and scrambled to turn on Juliana's white noise ocean sounds to drown out the clatter. Thankfully, she kept on sleeping. Then, as suddenly as she arrived, the worker hurriedly left the nursery, leaving the doors ajar. Ruth got up and shut them and the quiet returned. Ten minutes later she returned, now with three young children in tow.She again propped the doors wide. I scowled and again worked to drown out the noise, which clung to her like a shadow. When she left, Ruth again shut the doors. But again she returned ten minutes later and again she smugly propped the doors wide and sat down to sip her tea and chat with another airport employee who had come in moments before. Soon, a mother with an infant wrapped in several layers of thick clothing joined us. Juliana finally succumbed to the clammor and woke up, but boarding time was approaching, so it was OK. As I changed her daiper, the doors stood open. But everything changed the moment the Chinese mother started peeling away the layers of her child's clothing. Suddenly, the smug door-flinger-opener became concerned about a draft coming into the room. "The baby will catch a cold," she exclaimed as she hurried to close the doors. Again the room grew quiet as we walked to the gate to begin boarding our plane. Still, I think it was the quietest place we've ever found in an airport -- certainly the first time since Juliana hit six months that she's taken a decent nap in one. 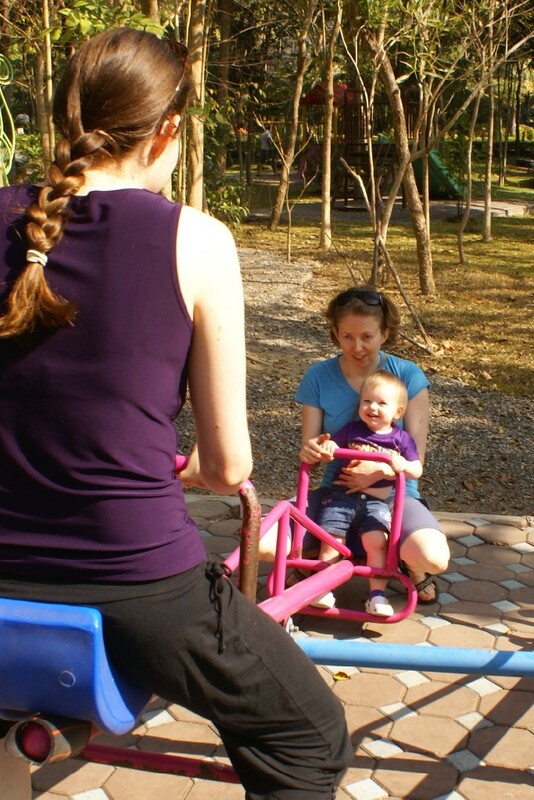 The good thing about traveling with a toddler is that the world is their playground. Juliana loves airports; she can spend hours running around, banging on chairs, and climbing stairs and ramps. At each new hotel room she is excited to find another phone, another fridge right at her level, and more tiny spaces under furniture to shove her toys into. At our last place on the ground floor, Juliana took great joy in walking out the patio door right outside! A nice change from six floors up. 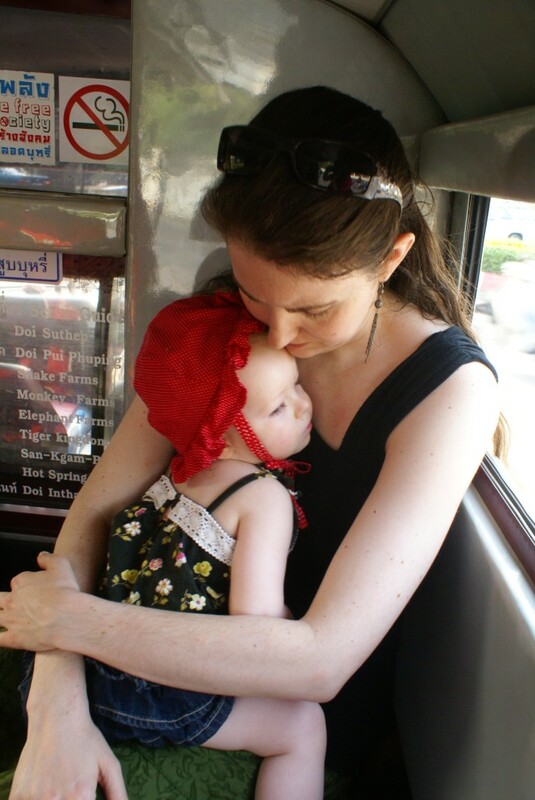 In many ways, though, traveling with a toddler is difficult. 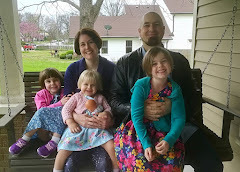 I'm not a strict schedule person, but I do think toddlers benefit from a good deal of routine, consistency, and predictability, none of which are abundant in travel. Some days she was already waking up from her nap at 2pm; other days she wasn't getting to sleep until 3pm. Some days she ate dinner at 5pm and other nights we didn't get to eat until 7pm, pushing back bedtime extra late too. Some days she had no problem with a flexible schedule; other days it made for quite a crabby baby. And this time we didn't even have to factor in jetlag! Finally something I love to eat! 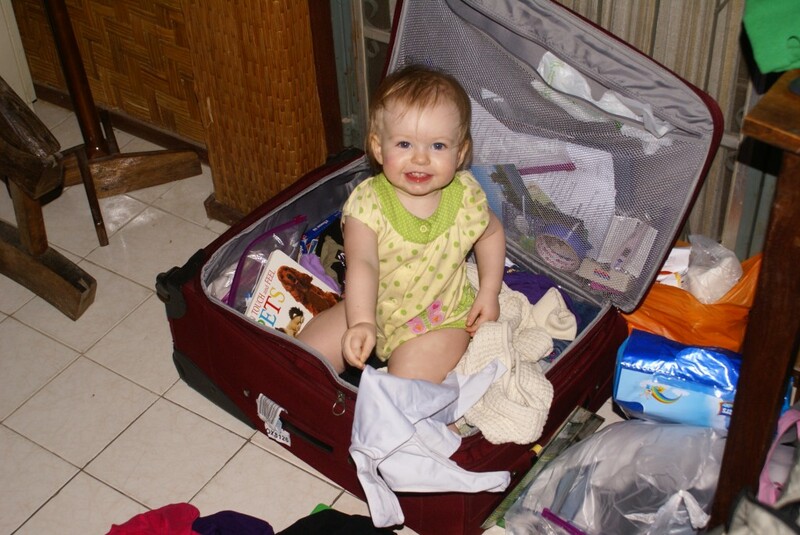 The long days of flights and airports are tiring but the weeks away from home were also starting to wear on Juliana. By the end she started getting extra fussy, even needing extra naps. She wanted to be touching me 90% of her waking hours, and if she was as far as 2 feet away she would pitifully cry, “Mumm-ma! Mumm-maaaa!” At home, Juliana squeals impatiently and grabs her hat when anyone mentions going outside. While traveling, on the other hand, she was excited whenever we got back to our room. Oh, and did I mention that the entire time she was working on two painful molars? I've always heard that molars are difficult, but I didn't realize they took so long to come in! Poor baby. Despite all that, Juliana mostly enjoyed the travels. She got to charm hundreds of new people and play peek-a-boo with strangers on the plane. 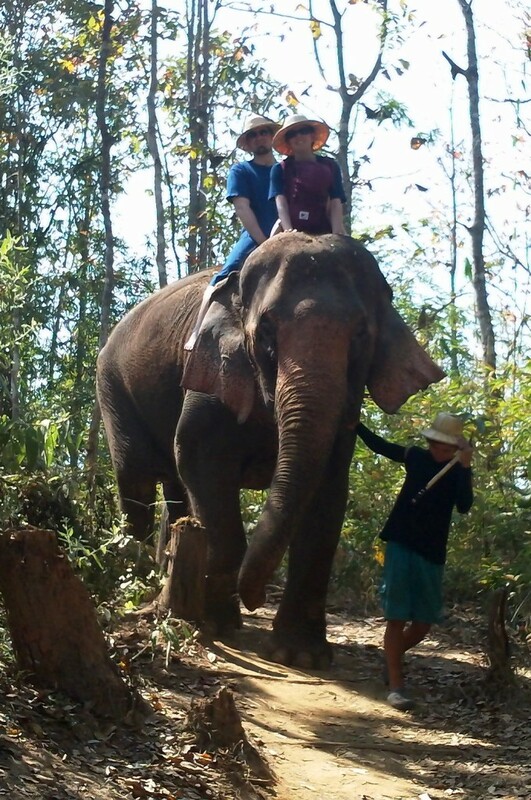 She got to ride an elephant and discovered their mutual love of bananas. She even took a nice nap while swaying along atop a lumbering elephant. She played with her aunt Melissa, who taught her important life lessons like how to climb up a slide. She went swimming and sliding and walked barefoot in the grass. She got to have bare arms and legs for three whole weeks. She played with other kids and went outside every day. She took her 16-23rd flights. Quite a lot of activity for a seventeen month old! 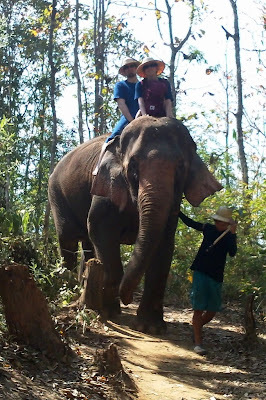 Taking a ride atop a 4 ton elephant. (She's inside the carrier getting in a nice little nap).